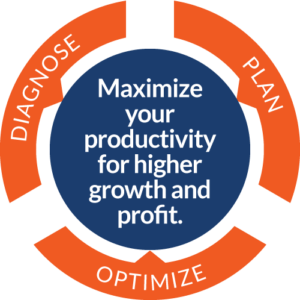 The Support Functions Maximum Productivity DPO System® is a three stage process that starts with a deep analysis of your current situation (Diagnose), then devising a strategy with detailed instructions (Plan), followed by implementation to achieve defined results (Optimize). We apply tremendous emphasis to the diagnosis stage by studying the foundation of every area that may need optimization. Managers and owners often express the reason for problems as they believe them to be. We use that input and go deeper by talking to other staff members and running tough assessment checks. This helps us pinpoint exactly where problems affecting productivity exist or could emerge in future. Based on our findings, we devise a customized solution that is best suited for your business. In the planning stage, we present you with a strategy and the plan for its execution. This is discussed with the organization’s head and senior managers where the end results and steps to get there are agreed upon. After the plans are finalized, all operational procedures are fully documented and teams are thoroughly briefed on the implementation procedures for optimization. While you can implement the solutions yourself, we also offer to supervise and manage the implementation in close consultation with your managers. We apply our unique DPO System® to all three areas of your business which we specialize in maximizing productivity of – Employees, Information Technology and Operational Processes. Our Diagnose, Plan, Optimize services can be availed of separately. However, we recommend that our expertise is hired for our total DPO package as a single service so we are involved in maximizing your productivity from the ground right up to the top. A typical DPO System® process requires six to twelve months depending upon on the size of the business and the unique needs of your organization.